Fees associated with filing trademark applications in Brazil, as well as other trademark fees, are available in the fee calculator. 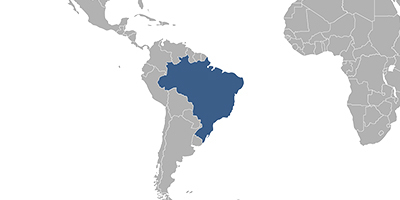 Multiple-class trademark applications are not possible in Brazil. A separate application must be filed for each class. The signed original of the POA form may be submitted to the Brazilian Patent and Trademark Office within 60 days from filing the trademark application in Brazil. A certified copy of the priority document must be submitted to the Brazil patent office within 180 days from filing. The period for filing oppositions against Brazilian trademark application is 60 days from publication of the application. The term for payment of the grant fee is 60 days from publication of a granting decision. It is still possible to pay the grant fee during the subsequent 30 days after the due date (but with a supplement). The trademark in Brazil is valid for ten years from the date of registration. It can be renewed for successive periods of ten years within twelve months before the expiration of the trademark registration. It is possible to file renewal within a grace period of six months from the expiration date. If the Brazilian trademark has not been used within five years after the granting date, it may be subject to cancellation. To perform the trademark registration in Brazil, foreigners should appoint an agent, a registered Brazilian trademark attorney. Online Database for Brazilian Trademarks Search.